EUR/USD continues to have a quiet week. Currently, the pair is trading at 1.1360, down 0.01% on the day. On the release front, there are no major events out of the U.S. or the eurozone, so traders can expect a quiet day for the pair. The eurozone will release consumer confidence, which is expected to post a second straight decline of -6 points. On Thursday, Germany and the eurozone release PMI reports and the ECB will set interest rates and we’ll hear from Mario Draghi at a press conference. The U.S. will release unemployment claims. With the global trade war showing no signs of easing, it is no surprise that growth forecasts for 2019 are heading south. On Tuesday, the International Monetary Fund lowered its global and eurozone growth forecasts. In October, the IMF projected global growth of 3.7% percent, but this has been revised to 3.5 percent. IMF head Christine Lagarde said that the world’s economy continues to expand, but “it is facing significantly higher risks”. The forecast for Germany was lowered to 1.3%, down from 1.9% in December. The IMF said that German growth had been dampened by weak consumer demand and lower factory production, notably in the car industry. The grim forecast follows a soft Chinese GDP, which dropped to 6.6% in 2018, its weakest level since 1990. The ECB has been below the radar over the past few weeks, overshadowed by the Federal Reserve. Policymakers at the Fed have shown a significantly more dovish stance since the December policy meeting, which has weighed on the U.S. dollar while sending the stock markets higher. 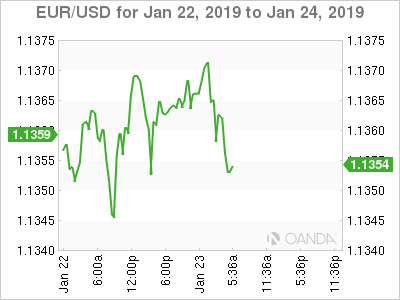 The ECB terminated its massive stimulus package in December, and a natural follow-up move would be a modest hike in interest rates – if the eurozone economy was performing well. That hasn’t been the case, as the economy slowed in the third quarter of 2018 and all signs are Q4 will also be soft. Analysts had predicted a rate hike in the third quarter, but sluggish economic activity has pushed off that forecast until the fourth quarter. The markets are keeping a close eye on the ECB policy meeting on Thursday, looking for clues with regard to future rate policy.